A few weeks ago I shared some photos on Instagram of the toiletries bag I took with me on a one-week trip to the mountains of Maine. 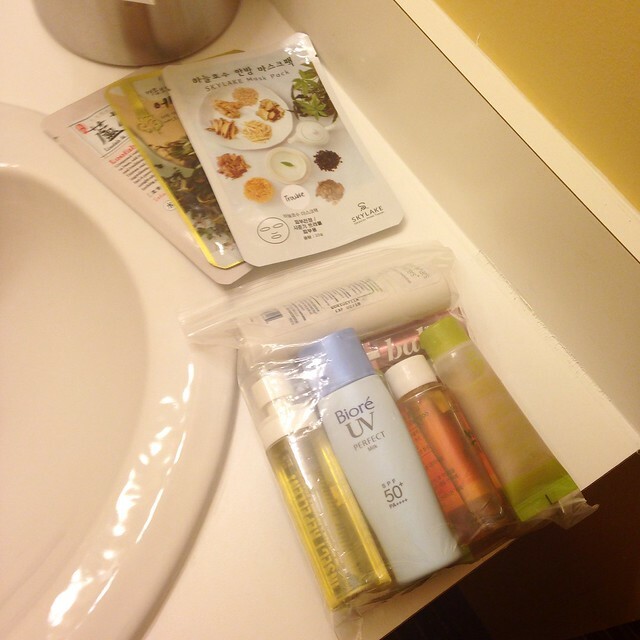 I wanted to expound a bit on my tips and tricks for travel skin care here. I opted to bring only carry-on luggage, so I was limited to a 3-1-1 bag, as per TSA standards. I found out that sheet masks don’t generally count towards your liquids/gels/aerosol limit, and can confirm that I brought them through security with no trouble. But I still had to fit a multi-step, Korean-inspired skin care routine, hair care for thick, mid-back-length hair, plus deodorant and bug spray into a quart-sized bag. While I managed, it was a tight fit and definitely used my Tetris skills. Decide what is non-negotiable: For me, number one is sunscreen. I knew I was bringing a full-sized bottle of a water-resistant sunscreen that I knew wouldn’t break me out. I also knew I wanted my essence. In the future, I will refill my decant jar with my preferred gel moisturizer as well. See where you can edit: Like I said, I didn’t bring my whole makeup bag or even all the steps I use for skin care. The first thing I decided to leave at home was my vitamin C, as the antioxidant oil has some vitamin C in it, and I didn’t want to risk oxidizing my vitamin C serum by carting it around for who-knows-how-long during travel. Then I also chose to leave my exfoliating acids at home because travel notoriously upsets my skin and the last thing upset skin needs is actives. Finally, I drastically simplified my makeup because the conference I was attending involves a lot of outdoor activities and I knew I wouldn’t be wearing a red lip while hiking anyway. I also chose to buy sunscreen for my body at the conference site because you need enough to get proper coverage, that it’s not hard to use up a full-sized tube during a week of constant daily outdoor activity. Find trial and sample sizes: I found trial sizes of my shampoo, a good conditioner, cleansing oil, facial oil, and toner. I’ll probably refill some of the trial-size containers with products I use regularly, too. Then I got sample packets of essence, ampoule, cleanser, and BB cream. And I tested literally everything weeks before leaving on my trip. I also had some samples from Sephora and other orders that I’d tried before and knew I liked. Generally not a good idea to bring anything that’s utterly untested on travel. Decant where necessary: I didn’t have to decant my own products (the Mamonde decant was one I bought off a skincare exchange board), but I will next time. I can replace the cleansing oil with my everyday cleansing oil and the sleeping mask with my night moisturizer. I also have some small travel bottles to decant my other hydrating essence, if I want to in the future. Supplement with soothing and hydrating sheet masks: I looked around and decided that it was a pretty safe bet to bring sheet masks outside my 3-1-1 bag, so I threw a few sheet masks in my bag. I focused on masks that are good for breakouts and upset skin because I knew that 1.) travel makes me break out and 2.) I would be spending a lot of time outside. And it turned out great. I came home from one particularly long afternoon hike, took a long shower, and sat for a half an hour with an aloe mask on before evening sessions and my skin was very happy indeed. 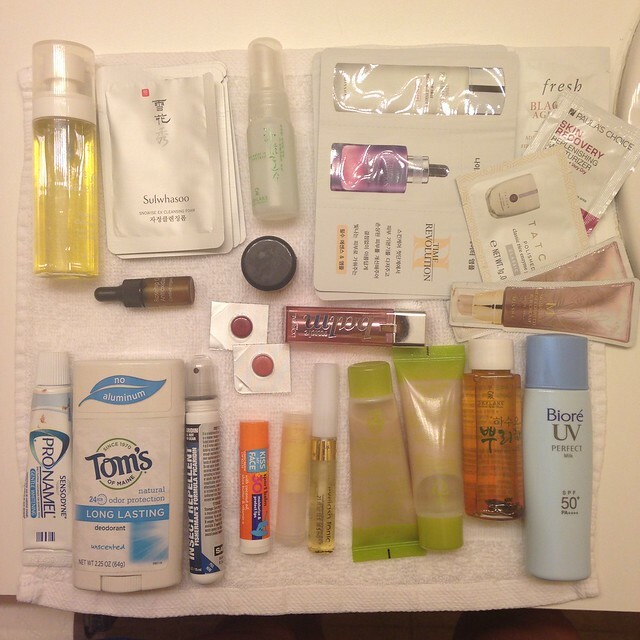 So those are my thoughts about traveling with skin care. I will have another chance to put the tips into practice soon, but I think that’s a good place to start when trying to curate your routine for travel. Who still has fun vacation plans coming up?